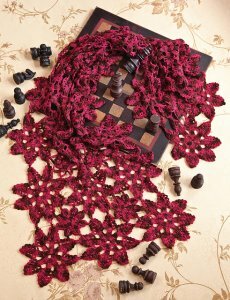 Taken from Crochet Red: "Perfect your motif-making and joining skills with a lovely spring wrap. Floral motifs connect as you go to create a swirl of color and lace." Size US C/2 crochet hook (or size needed to obtain gauge) and a tapestry needle are required but not included. Finished Measurements: 52" x 18" after blocking. Gauge: Large motif = 6" across diagonal points. Color Shown is Wilted Rose.